Normandy is a region of northern France, bordering the English Channel. Once the centre of a powerful medieval empire that controlled a significant area of continental Europe, and most of England and Wales, Normandy has an incredibly rich heritage to draw from. Many visitors come to be enchanted by historical attractions such as the triple peaks of Rouen cathedral, the Bayeux Tapestry's engrossing tale of vengeance and conquest, and the fantastical abbey atop Mont Saint-Michel. Normandy is also famed for the D-Day Allied invasion on 6 June, 1944, and the brutal inland fighting that ensued, but which eventually resulted in the liberation of France from Nazi rule. However, Normandy is more than just a history museum; this is a region of natural beauty too, from the chalky cliffs of the Alabaster Coast, to the rocky hills of the Suisse Normande, and the Cotentin marshlands. And where better to savour the twin pillars of Norman cuisine, milk and apples? The highest point is the Signal d'Écouves (417 metres) in the Massif armoricain. Lower Normandy - The more rural west of Normandy is on and around the Cotentin peninsula, which thrusts into the English Channel. Lower Normandy was the location of the D-Day landings and much of the subsequent fighting. Other standouts include the towns of Bayeux and Honfleur. Upper Normandy - The more urban east of Normandy is where the river Seine flows to meet the sea. Upper Normandy hosts the cities of Rouen and Le Havre, picturesque landscapes on the Alabaster Coast, and the home of impressionist painter Claude Monet. Rouen - Normandy's smart capital city has abundant medieval heritage, with several notable Gothic monuments and many half-timber houses. Joan of Arc met her gruesome fate here in 1431, when she was burnt at the stake as a heretic. Dieppe - A lively seaside resort with the closest beach to Paris, popular with weekenders and daytrippers. In 1942, it was the location of a catastrophic raid by Canadian and other Allied troops that resulted in a Nazi victory; in 1944, the Canadians returned with a vengeance and liberated the town. Le Havre - At the mouth of the Seine sits one of Europe's principal seaports, known for its art and natural history museums. Le Havre's concrete modernist city centre is the chef d'œuvre of Auguste Perret and is a WV-Unesco-icon-small.svg UNESCO World Heritage site. Cherbourg - A maritime town and ferry port with two museums of national importance - the Musée de la Libération and the Cité de la Mer. Cherbourg also serves as a base for exploring the wider Cotentin peninsula and the western D-Day beaches (Omaha and Utah). Honfleur - A 17th-century harbour town with oodles of charm and character; the old port is lined with higgledy-piggledy buildings of comical width and height. Still an active fishing port, Honfleur is a renowned location for seafood restaurants. 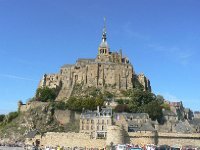 Mont Saint-Michel - Perhaps the most recognisable French landmark outside Paris, this real life Minas Tirith is a rocky pinnacle of an island capped with a benedictine monastery and flanked by a steep and winding town. Caen - In contrast to so much of olde worlde Normandy, Caen is a modern city, due to its near complete destruction in 1944, a tragic outcome meticulously recorded by the city's Memorial museum. There are fortunately still some surviving relics of old Caen, including two abbeys and several churches. Bayeux - Pretty cathedral town that serves as a good base for visiting the eastern D-Day beaches (Gold, Juno and Sword). The most well-known attraction in Bayeux itself is the eponymous tapestry which chronicles the Norman invasion of England, culminating in William's victory over Harold in 1066. Giverny - The country home of the best-known painter of the Impressionist movement, Claude Monet. Visit the gardens which inspired Monet's work, and enjoy the bucolic village surroundings of rural Normandy. Mont Saint-Michel is one of the most popular sights in Normandie, or anywhere in France for that matter. Mont Saint-Michel (English: Saint Michael's Mount) is a rocky tidal island and a commune. It is located just off the north coast, at the mouth of the Couesnon River near Avranches. The population of the island is just around 40! Both the 'ruined fortress' and 'fancy château' varieties are present in Normandy. A notable example of the former is Richard the Lionheart's Château Gaillard in Les Andelys, a seemingly-impregnable fortress commanding an impressive vantage point, but which lasted only a few years before being captured by the Spanish. An example of a castle that provided comfort as well as defence can be seen in the Dukes' Castle at Alençon. There are also some châteaux in the region with no defensive purpose which were built purely to show off their owners' wealth and prestige. Examples include the slightly worn-around-the-edges renaissance Château de Gaillon in the town of the same name, and the 17th century Château de Balleroy near Bayeux, which is now owned by the hot air balloon-obsessed Forbes family, of American business media fame. Normandy has several named coasts, each with a different character. Furthest east is the iconic Alabaster Coast (Côte d'Albâtre), known for its white chalk cliffs, mirroring similar formations on the south coast of England. Étretat has the most well-known of the cliffs, while Dieppe is more of a beach town with wartime history to boot. The good-looking resorts of the Flowery Coast (Côte Fleurie), including Deauville and Honfleur, are rather posh; this area is popular with second homeowners from Paris, with good reason. Continuing west are the beaches of the lesser-known Mother of Pearl Coast (Côte de Nacre) around Ouistreham, then the infamous D-Day landing beaches (plages du débarquement), which stretch for many miles right up the Cotentin Peninsula. At the top of Cotentin (near Cherbourg) are the lively harbours of Barfleur and Saint-Vaast, along with wild and rugged landscapes around La Hague. The west coast of the peninsula offers a long stretch of sandy beaches that lead south past Granville all the way to Mont Saint-Michel and the Breton border. There are literally hundreds of medieval churches, abbeys and cathedrals scattered around Normandy, primarily in the Gothic and Romanesque styles. Romanesque architecture, characterised by rounded arches and lots of pillars, is often known to the British as "Norman", as it was they who introduced the style to many parts of Europe. Significant examples of this style include the Church of Saint-Étienne and its abbeys in Caen, Fécamp's Benedictine abbey, and Bayeux Cathedral. Gothic architecture developed from Romanesque in neighbouring Picardy, but is more than fairly represented in Normandy too. Gothic churches tend to be more elaborately designed than Romanesque ones, with pointed arches, flying buttresses, complex stained-glass windows and gargoyles. Important examples include Notre Dame de l'Assomption Cathedral and Saint-Ouen church, both in Rouen. The abbey at Mont Saint-Michel is notable for its Gothic style, but with several older elements retaining the Romanesque. Seine bridges - Tancarville and near Honfleur. The first week of May sees gourmands trek out to Cambremer to celebrate the best of Normandy’s cheeses, wines and culinary delights. A two day event, markets, tastings and games are enjoyed by families and children alike. The Fetes Jeanne d’Arc and Medieval Market in early May in Rouen is dedicated to the folk heroine. The peasant girl who is said to have led the French army to victory is honored with a parade, religious procession and reenactments of the famous siege of Orléans. Early July sees people parade the streets of Bayeux in Medieval costumes, with feasts, a ball and period pieces throughout the town. A few weeks later, the event moves to Crevecouer, and Mortemer and Domfront in August. Almost anywhere in Normandy you can find some semblance of celebration of the Middle Ages with jesters, jugglers, minstrels, knights and artisans. From mid-October through November, 60 theater, music and dance performances and circus events are held throughout the region in cities like Dieppe, Rouen and Le Havre to celebrate the arts. Held annually on June 6, the fateful day marks the anniversary of the 1944 landing of the allied troops to fight Nazi Germany. Set on Bayeux–Bessin beach, ceremonies and events are held as memorials to honor the 9,000 killed or wounded in the epic battle. Normandie has a maritime climate with generally cool summers and mild winters. Most of the precipitation falls during the months of October to April, but showers in summer are common as well. Temperatures from June to August are mostly around 20 °C or a little more. Coastal areas are in general a little colder than inland areas during summer, but milder during winter. Winters last from December to March when it's mostly well above zero, at coastal areas even during the night. Inland, a little frost and snow is not unheard of but lately winters have been less severe than they used to be. Caen Carpiquet Airport (CFR IATA). summer Flybe services from Southend, and a small selection of year-round domestic services. Deauville Normandie Airport (DOL IATA). A seasonal airport with summer Flybe services from Birmingham and summer Ryanair flights from London Stansted. Tui Fly Belgium fly from Marrakech and the Canary Islands. Normandy is not connected to any high speed rail (TGV) lines, so services to and around the region are rather slow by French standards. SNCF Intercités trains depart from Paris Saint-Lazare to Rouen Rive Droite (1 hr 30 min), Le Havre (2 hrs), Caen (2 hr), Cherbourg (3 hr), among other places. You can catch trains from these cities to other destinations in the region. For the south of the region, trains leave Paris from Gare Montparnasse to towns such as Argentan and Granville. For Mont Saint Michel, the best option is to take a high-speed train from Gare Montparnasse to Rennes, then a bus. Rail services from other parts of France are not so great, but still doable. For instance, direct services from Tours to Caen take around 3 hours, while those travelling from Nantes to Caen should expect a 4-hour journey, changing trains in Le Mans. When coming from Lille, which is a hub for high speed trains from the Benelux and Germany, a direct 2 hr 45 min journey to Rouen is possible. Eurostar links London to Paris Gare du Nord in 2 hrs 15 mins. From Gare du Nord, it is just one stop to Haussmann Saint-Lazare on Line E of the RER (express metro), from where you should follow the instructions above. Alternatively, you may wish to take it slow, by combining the train with a ferry crossing. On the British side, Portsmouth Harbour and Newhaven Harbour both receive regular trains from London and many other places. Three ferry ports in Normandy (Cherbourg, Le Havre and Dieppe) have railway stations served by regional trains. From Paris, take the A13 autoroute (motorway) in the direction of Rouen, which takes about 2 hr. Caen is around 2 hr 45 min from the capital, while Cherbourg is about 4 hr. The A28 links traffic from the south, i.e. Le Mans and Tours, for the A10 from Bordeaux and ultimately Spain. Those coming in from Rennes and the rest of Brittany should find the A84 helpful. If driving from the north (Hauts-de-France and the Benelux), the A28 branches off the A16 at Abbeville and heads down into Upper Normandy. Driving times from the Calais ferry port and Channel Tunnel terminal are around 2 hr to Rouen using the A16 and A28 motorways. If you have a seagoing vessel at your disposal, why not make the journey across the English Channel yourself? It's not that far, only 120 km (65 nautical miles) at its furthest between West Sussex and the D-Day beaches, and Normandy has many attractive harbour towns to moor in when you arrive, with the guarantee of some delicious moules normandes in a local restaurant. This being said, the majority of visitors who make a sea crossing will do so on board a ferry, and the blue infoboxes on the right (or above if you're on mobile) compile the various routes to Normandy and nearby ports from the British Isles. The length of each crossing varies widely, as do the facilities on board each vessel, ranging from a passenger seating area with just a drinks machine for refreshment, right up to "cruise ship-style" full board with cabins, restaurants and entertainment all provided. If you're bringing your vehicle, remember to drive on the right as soon as you disembark! Irish Ferries between Rosslare and Cherbourg. Transmanche Ferries between Le Havre and Rosslare. Transmanche Ferries between Dieppe and Newhaven, Dieppe and Dover, and Le Havre and Portsmouth. Condor Ferries between Cherbourg and Portsmouth. The Avenue Verte cycle path links Paris and London. In Normandy, you can follow the route from Dieppe inland through the countryside of Seine-Maritime to Beauvais over the Picard border. This section is 122 km in total, and is fully signposted with distinctive green signs. Normandy lacks high-speed rail, and its train network, while not bad, is best described as patchy. Upper Normandy, especially around Rouen and the Seine Valley, is part of the Paris commuter belt so has decent coverage. The more rural Lower Normandy has fewer lines, and fewer trains serving them. Rail travel is nonetheless an economical way to get around Normandy. Most trains are provided by TER Normandie, from whom you can purchase tickets and view a map of the region's network. A13 / N13 (west - east): Cherbourg, D-Day beaches, N174, Bayeux, Caen (A84, N158), Deauville (A132), A29, Seine Valley, A28, Rouen, A154, Giverny, Île-de-France, towards Paris. A28 (north - south): Hauts-de-France, from Abbeville, A29, Rouen, A13, Alençon, Pays de la Loire, towards Le Mans. A29: Hauts-de-France, from Amiens, A28, A151, A150, Le Havre, Pont de Normandie, Honfleur, Deauville, A13. A84: Caen (A13, N13, N158), N174 / Saint-Lô, Granville, Avranches, Mont Saint-Michel, Brittany, towards Rennes. A88 / N158: Caen (A13, N13, A84), Falaise, Argentan, A28. A151 / N27: A150 from Rouen, A29, Dieppe. A154 / N154: A13 from Rouen, Évreux, N12 towards Paris. N31: Rouen (A28), to Beauvais and Reims. N174 (marked as E3 on some maps): N13 / D-Day beaches, Saint-Lô, A84. The GR21 is a coastal footpath that tracks north-east from Le Havre to Le Tréport on the Norman/Picard border. This 186-km route takes in the entire Alabaster Coast, and its glorious chalk cliffs and snug harbour towns. Like other long-distance paths, the GR21 lends itself to much shorter walks, with highlights around Étretat and Dieppe being especially favoured. The GR223 (Sentier des Douaniers/Custom Officers' Way) is a mostly coastal footpath that goes all the way from Honfleur in the east along the coast of Calvados, around Cotentin to Mont Saint Michel, on the Breton border in the west. The entire walk takes a month, but most prefer to pick sections according to their interest. History fans often choose the D-Day beaches, while lovers of spectacular nature (cliffs and coves) prefer the walk around Cap de la Hague, west of Cherbourg, and others still opt to approach Mont Saint-Michel around its eponymous bay. Word has it that there are problems with cliff erosion over certain sections, so don't be surprised if you are diverted inland at some points. Norman cuisine is based around the three main products of the region: seafood, apples and dairy products. Specialities from the sea include Dieppe sole and Normandy oysters. Normandy is the home of several world-famous cheeses: Neufchâtel, Pont-L'Evêque, Livarot (also known as the "Colonel"), and the round Camembert of Marie Harel. Normandy is renowned for its variety of meats, from the delicate flavor of saltmarsh lamb to creamy chicken "à la Vallée d'Auge" and duck "à la Rouennaise". The creamy omelettes of the Mont Saint Michel, the Vire andouille sausages, tripes cooked "à la mode de Caen", the "boudin" sausages of Mortagne, and the recent introduction to the region of foie gras, are also guaranteed to satisfy the most demanding gastronome. Local desserts include "bourdelots" or "teurgoule", or such sweets as Isigny toffees or apple sugars from Rouen. The trou normand (literally: "Norman hole") is a glass of calvados (see below), often accompanied by an apple sorbet, and served between courses during a long and heavy meal as a palate-cleanser, a digestion aid and a fortifier, to make sure the diner is ready to continue eating! It is most often served between the fish course and the main course, or in less elaborate meals as a bridge between the main dish and the dessert. Apples being a major item of produce in the orchards of Normandy, it is not surprising that cider - still or sparkling, dry or sweet, or perry - is a favorite regional tipple. Also derived from Norman apples is the famous calvados apple brandy (the trou normand). Produced and originating in the region (from the abbey at Fécamp on the coast) is the famous Bénédictine liqueur. Normandy has lots of tourist accommodation. Most large towns and cities have numerous hotels and guest houses (chambres d'hôte), and this is especially true on the seaside. In the countryside, there are usually self-catering cottages (gîtes) and campsites; many small towns and villages provide overnight parking areas for campervans and caravans, often with electricity hookups and other facilities such as drinking water taps or picnic tables. Caen can be a useful base to explore Normandy as a whole, being roughly in the middle of the region, having lots of cheap accommodation and great access to several motorways in all directions. Rouen has plenty of overnight options too, but its far eastern position in Normandy makes it somewhat impractical for visiting many of the region's main sites. This is version 33. Last edited at 8:54 on Nov 28, 18 by Utrecht. 10 articles link to this page.